"Woh nahin Sir, yeh pass cross karna hai". Subhan said, his voice partially garbled in the radio transmission. 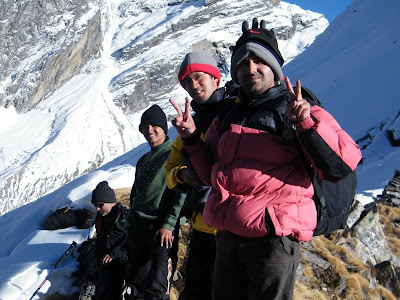 Subhan, Vinod and Kundu were looking like three tiny specks at the feet of an imposing mountain. "What???" I could not believe what he was saying. From where we were, this pass looked perched on top of a vertical wall of snow! "Yeh to technical lag raha hai. Isse kaise cross karenge? "- Arun asked, his eyes still examining the objective carefully. "Yehi Rasta hai Sir, hum kai baar aye hain. Doosra raasta me ek gulley hai. Bahut danger hai rock-fall ka"- One of the senior porters replied. "Lagta hai rope lagana padega. 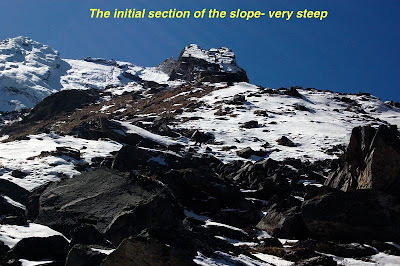 Oopar thodasa technical climb lag raha hai"- The veteran –Jaisingh offered his assessment. All of us looked at him with utter incredulity. "Sheer Madness!! Let them take the call. Why are we suggesting?" exclaimed Rajesh not quite appreciating the enthusiasm. "Sir yahan pass ka base main aa jao, phir decision lete hain" Vinod's voice crackled over the radio. He was already half a kilometer away conferring animatedly with Subhan. "Shahid bhai, map nikalo"- I asked of Shahid and he promptly obliged, with the the Google Earth printouts, neatly filed in a plastic folder. Seven heads pored over the little printout anxiously to find any opportunity to avoid the sinister looking wall of rock, snow and ice. Half an hour later, having not found any possible alternative,we decided to get a closer look at the wall. Meanwhile, Jaisingh had modified his views partially. "Lagta hai, woh rock band ka niche se approach hai"- He said. With reluctant feet dragging our tired bodies on that treacherously slippery slope of dry grass, we proceeded towards where the trio of Vinod, Subhan and Kundu sat huddled. 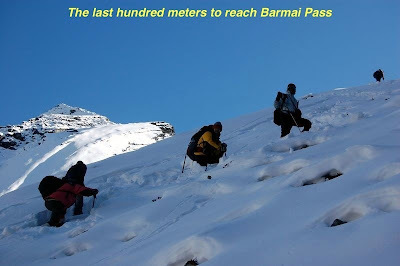 Just behind them was the wall, which they called as Barmai Pass, the only reasonably safe passage from Kagbhushandi Taal to Alakananda Valley. "So guys, are we ready for the pass?" I was asking Negi and Bharat leading ahead of me along the already steepening slope. "When you commit yourself to a difficult route, you don't say kind of. You say, 'I will do it'!" I said, thinking about the need for focus for the task at hand. "Since we don't have an option, we gotta say and believe, we are going to do it!" I was bit concerned about the team morale. "We will do it" – shouted out Shahid, coming up few steps behind me. So the team plodded on with mixed emotions and apprehensions. "Aur har din naya mission khada ho jata hai"… I filled in and the team burst out into a hearty laughter. Bharat and Venky had just reached the top. Rajesh, Shahid, Negi and I had reached minutes before and had our fill of shooting majestic pictures from that high vantage point. The laughter masked the great relief all of us felt after the tense moments few hours ago when we were committing ourselves to the route to the top. Resting briefly on the top of Barmai Pass , we saw a bright orange glow of a sun was about to set- lighting up the snow-scape around for 270 degrees. 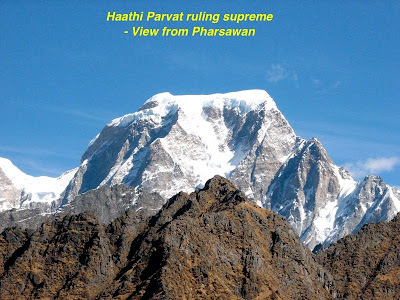 Haathi Parvat stood gloriously tall with all its 6700 Meters, ruling over everything that was in our view North. Shivering slightly with the onset of cold, these were the reigning thoughts in our minds -relief and disbelief. 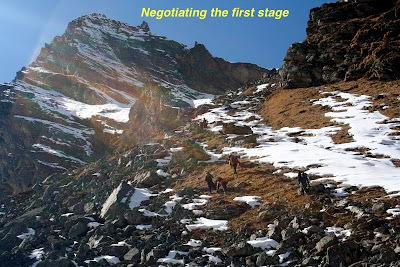 We had just negotiated a pass, whose apparent degree of difficulty had sprung up as a nasty surprise in an otherwise pleasant Himalayan afternoon. The mystical emerald lake Kagbhushandi Taal wasn't yet finished with all the surprises it could throw at us, as we would find out soon. 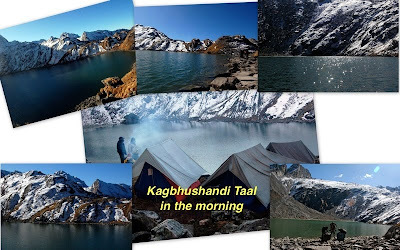 Searching for the list of high altitude lakes in Garhwal Mountains, this tongue twister of a name pops up all the time quite innocuously, "Kagbhushandi Taal". 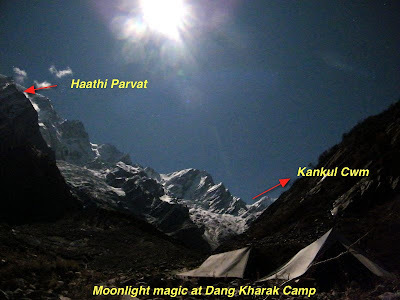 For the un-initiated there is added confusion since there is a peak by the same name located not very far from the Haathi Parvat valley. 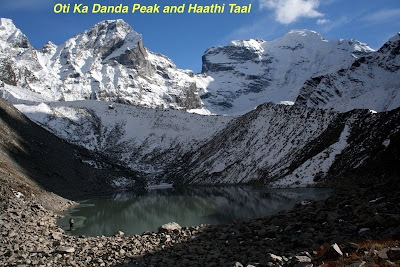 To add to it all, the very lake is named as "Kankul Taal" in the British Army map that many of us use (freely available at University of Texas website), probably named after the Pass one uses to reach the emerald lake from the Haathi Parvat valley. I went through all that a few years back in a frenzied December evening of Google Earth browsing, in the hope of a possible exploration of the route sometime in future. 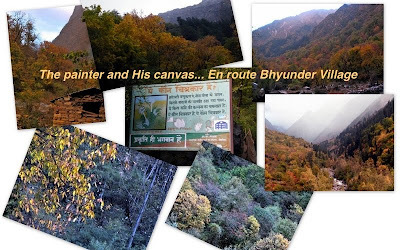 The route plotted after the research veers off East from the famous Hemkund Sahib- Valley of Flowers Trail, first done by M/s Frank Smythe and party almost a century back, at Bhyunder village. 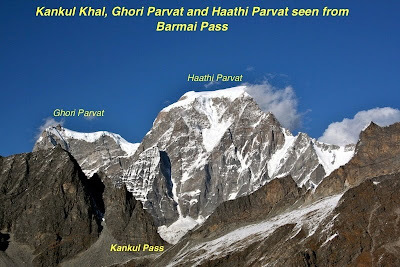 It then meanders up along a small river till the head of the Haathi Parvat valley until it reaches the terminal Cwm presided by the 6700 mtrs high Haathi Parvat and another smaller peak "Oti Ka Danda". 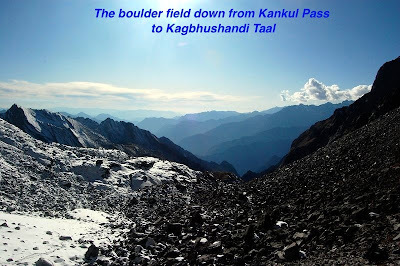 From there the route turns south over the Kankul Pass and descends into the little boulder-strewn recess where the Kagbhushandi Taal is located. 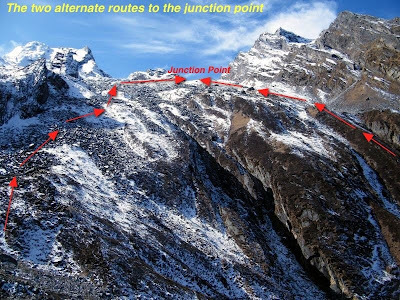 The route forth to Joshimath looked first a little unsure in the contour maps, at least for the first few kilometers, and then proceeded onwards along a ridge down to Vishnuprayag and Joshimath. As it happens always, The Mountain bade its time and finally allowed me to go for it at last in the November of 2009. I was fresh from the Lamkhaga- Nalgan pass trek done in June, but still this one happened, barely four months later!!! To make it special two additional features were added to the itinerary. As has been the practice in the last few years, a thread was floated duly in the Orkut and Indiamike community threads (lately I have had very high opinion of teams made out of the internet community- one gets to meet new friends and more often than not highly capable and enthusiastic ones). In due course of time a whole new team was formed (somehow all members of previous treks were in-disposed to join in)-another youthful team with widely varied backgrounds and profiles. Arun Negi and Bharat Tomar came from the IT fraternity. Both fit, energetic and willing to brave it if the situation so demanded. Arun, the Handsome Brute-force of a Pahadi proved to be a solid anchor in the middle later on. 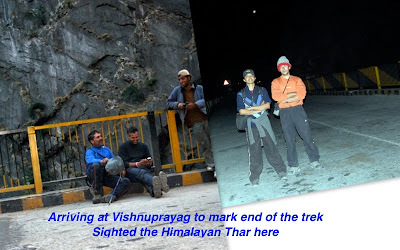 Bharat- Loveguru- Tomar proved his mettle in his maiden trek. The Rajput from Haryana carried on his role, be it for team entertainment or bringing up the rear in a tough climb, with equal aplomb. Ananda Kundu from Kolkata was the silent and gentle giant. A last moment joinee in his maiden trek, he fared well. The Robotics engineer-entrepreneur swore to take time out for exploring the mountains many times more, by the time we ended. 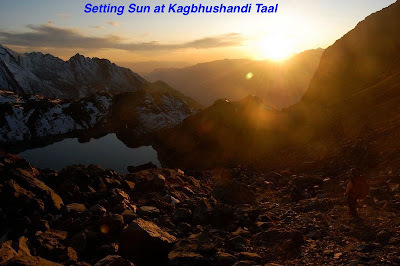 I had met Anand Venkat the first time browsing through some blogs, scanning some discussion thread on Kailash Darshan. Although we had interacted during some discussions on Mount Kailash, this was the first time we were going to be trekking together. I was shocked out of my mind when I saw the smiling young lad for the first time! Barely a facial hair on him, he looked the youngest. By the time we ended the trek, my respect for the Youngman had grown several fold. A tireless campaigner and silent worker, he works magic when behind his Nikon lenses. 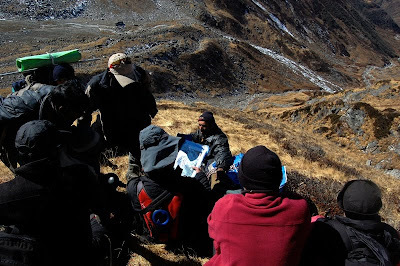 Rajesh's hearty laughter and animated comments rang in the ears weeks after we ended the trek. The maverick ex-banker- Outrageous- NGO activist who is also husband to my ex colleague went out for the first time with me on a trek. Although we had exchanged notes several times on various trekking experiences, this was the first time we were together on one. He was the other senior citizen in the team (other than me). 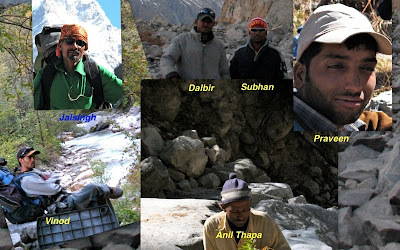 Shahid Ali had earlier interacted in Orkut when he was planning his solo trek to EBC (Everest Base Camp). The Audiologist from Bangalore donned a commando look when in the mountains. Always willing to take up a challenge he proved good in all roles- Lead, Middle or bringing up the rear. No wonder he had earlier survived serious weather conditions in the foothills of the highest mountain peak on earth. The Support team was interestingly structured as well. A 4-member core team was hired from Crystal of Uttarkashi (Old and trusted friends as Vinod, Jaisingh, Praveen and Anil) who then arranged the rest of the resources locally from Joshimath. 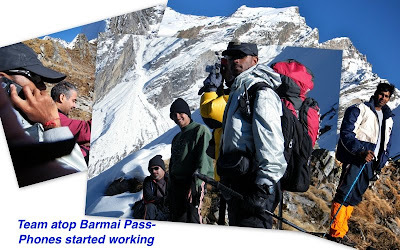 The porters were hired from a porter agency at Joshimath who also provided a local route expert in form of Subhan and the necessary permissions from the forest department. Subhan claimed to have done the route couple of times himself. 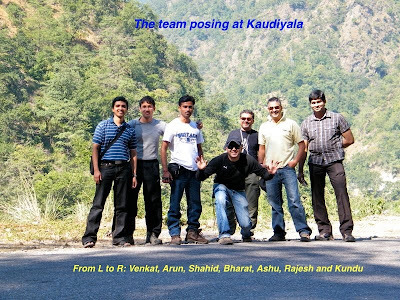 I remember the long drive to Joshimath from Delhi as one that was tiring and draining but funny as hell!! One advantage of not having ladies in the team is, as a driver, you really don't have to plan stoppages for such matters as relieving oneself. One could just stop anywhere you liked and felt like :-). I was happy. Bharat, however, took some opportunistic advantages of that fact. "Dada, ek minute ek photo", "Dada kuchh khate hain na", "Dada thoda pani lete hain", "Dada this and Dada that!!" Thankfully some of the many stopovers he proposed, allowed me to steal few winks of sleep. It is an additional fact that some fabulous shots have been shot during those myriad stopovers for toilet, food and just plain nature watching. We started off from Delhi at about 0400 Hrs and were in Rishikesh by 0930 Hrs after some undue delays on the way due to fog and poor visibility. After taking a short power nap and some hasty South Indian breakfast, we were past Devprayag by 1300 and were in Srinagar for lunch by 1430 Hrs. Amidst some hilarious lectures and banters of M/s Bharat and Shahid, we were at Joshimath by 2000 Hrs. It was interesting to listen to the "Do-it-yourself course" for "50 dates in 10 days" by Baba Bharat. Anyways, happy ending for a grueling 16 hrs drive with no sleep in the previous night. Phew! Once settled in the hotel, it was time to party!! Next day onwards it was walk all the way for 80 Kms!! Next day Vinod woke us up early at 0700. By the time we were lazily ready, it was 0930. 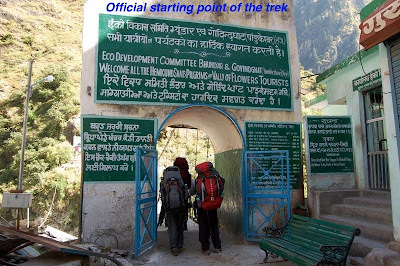 It took another two and a half hour to actually begin the trek from Govindghat. Learning poi nt!! 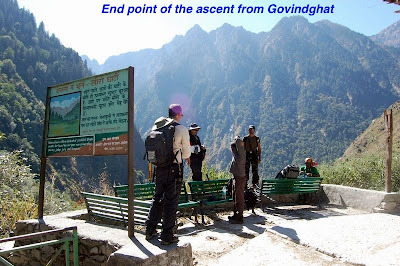 It is better to stay at Govindghat than at Joshimath so that one can start trekking early. It is downright depressing to start a trek with the sun beating down harsh on your head. After filling up water bottles at the Gurdwara at Govindghat, it was time to hit the trail. Old memories came flooding back as I started off across the suspension bridge over Alakananda, her waters bearing the turquoise hue, so typical of all Himalayan Rivers at this time of the year. For someone who would have visited Hemkund Sahib and Valley of Flowers (the trail that we were on), the solitude and calm would immediately be apparent. In season, these very routes shall be teeming with thousands of pilgrims of all age and origin, the route would be lined with shops, trade would be brisk, the air filled with the smell of human beings and mule-dung, the chants of the people and the neighing of the horses filling the ears; I liked the change. 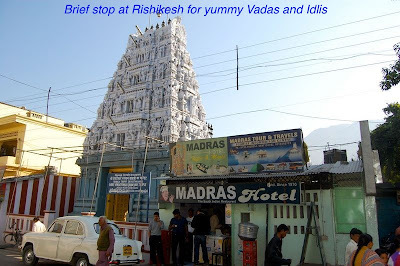 In the tough climb out of Govindghat, there was a funny interlude when w e saw a signboard put up by the local managing committee, exhorting tourists and pilgrims to write their suggestions in the "Suggestion Rock"! Probably a minor error on part of the painter, but in that mountainous locale, with several utterly funny interpretations and visualizations. 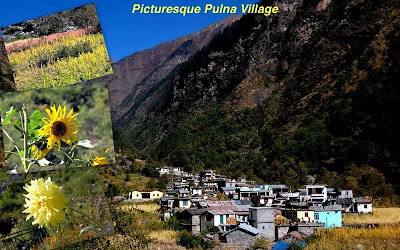 By the time we reached the pretty Pulna village, we were suddenly aware that Vinod and the party of porters are far behind and faintly within radio contact. 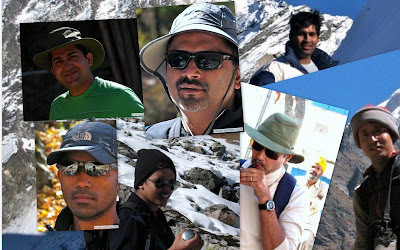 Meanwhile I was enjoying the almost forgotten memories of a trek done 16 years back. The whole trail had changed so much since 1992 that it was like doing the trek anew. The colors of the fall added on to the novelty. Pulna village was probably a cluster of few houses when I visited the place a decade and half ago. Now it was a bustling settlement with a prominent concrete arch welcoming the passers-by. The sparse population of the village was merely a reminder of the season. Colorful Marigolds, Sunflowers and Dahlias adorned the area near the welcome arch. Bright red fields of "Chaulai (an edible "saag" which also bears flour bearing seeds)" lined the narrow dirt-road leading into the village. 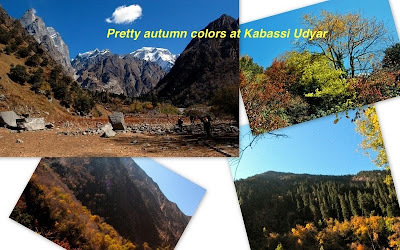 We had not realized till then that this was only a trailer of the spectacle that the Mountain was going to unfold; a Himalayan Autumn surprise! The forest ahead wore various hues of red, yellow, purple, green, brown and a multitude of other shades; so vivid and colorful, one is reminded of flipping through the pages of a comic book. Soon it was lunchtime and we stopped under a small cluster of sheds, which might have been serving as refueling point for hungry and thirsty pilgrims during the season. Now of course they were all deserted. Chomping through Paranthas and Pickles we had another hilarious discourse by Loveguru- Bharat about some theory on Chocolates and Women. The only nagging issue in the mind was the slow progress of the Porters' Team. They were yet to be contacted over radio!! It was 1500 Hrs and we were already half way through!! At that rate, we would be at the designated campsite by 1700 and wait for the porters to arrive by 1900! "Not a nice idea", I mused. For a moment I regretted not getting porters from Uttarkashi, who were familiar and whom I trusted not to turn their back at the middle of the trek. We decided to wait for the porters for the simple reason that we needed to be sure that the porters were coming after all! No point waiting for them at Bhyunder village without a fall back option for the shelter for the night. The problem resolved itself 45 minutes later when the porter team finally came up. After a sharp and pointed communication with the Porter Sirdar-Dalbir and Subhan the local guide, we proceeded towards Bhyunder, relieved and hopeful. It is difficult to put to words, the subliminally divine experience. 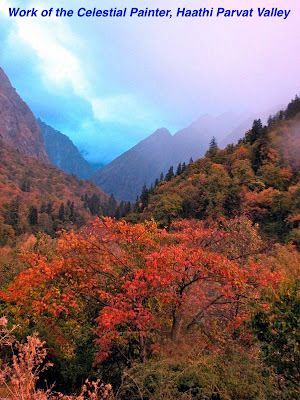 The gentle drizzle, the whispering susurration of the breeze carrying colorful leaves of the fall, the baby goats calling out animatedly for their returning mothers, the patches of snows and clouds in the high mountains difficult to tell one from the other- all of it just whisked one off to another world. We insisted upon camping down on the little field across the bridge over Laxman Ganga. This is where we were to veer off from the VoF route and catch the robustly constructed trail into the Haathi Parvat Valley. In about an hour everybody assembled at the camping ground. By the time tents were pitched, it was already dark. Price paid for starting off late. The larger the village, the eerier it looks when deserted. Watching the silent outlines of the Bhyunder village, still shivering by the small campfire, I was thinking of the day ahead. The small camp was stirring lazily to life. We knew we had a long walk ahead. We had targeted reaching the head of the valley, if we were to spend any meaningful time exploring the glacier and looking for the small un-mapped lake. After some easy idle talk, we were all ready in a hurry and had hit the trail by 8:30 AM. Good show! I thought, we all had been regretting the late start, the previous day. Not long after the Bhyunder camp, the jungle grows even denser. The well made Chhe-phuti (6 Ft wide) trail twists its way through the abundance of conifers, all of them rich with their zillion colors of the fall. Dry maple leaves with their shades of red, brown and yellow carpeted the track amidst faint piercing calls of crickets. Not a bird to be heard or a call of a monkey. It was a silent pleasure walk with a colorful canopy overhead through which the sun pierced in with numerous needles. One could hear a distant gurgle of the river we were following up east. Who would not treasure those moments of total immersion and silent reverence for a force so powerful yet so eloquent and pretty! After an hour of walk one reaches a small opening (probably can serve as a camping ground for a small party) from where the mighty bulk of the Haathi Parvat reveals itself over the tree line. Shortly thereafter one crosses a concrete bridge to cross over to the river's true left. Just after crossing the bridge the route seemed to disappear beneath the thick undergrowth. Watchful eyes tracked the route back and soon we were over another makeshift bridge back to the true right of the river. 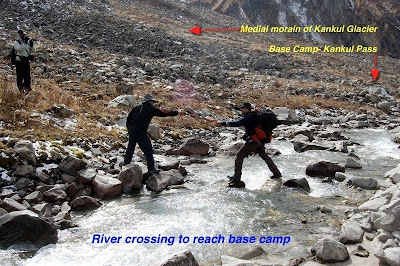 From now on, we would remain on the true right till we cross it over at its origin near the Chainyal Kharak camp. That's when Shahid Ali declared, he has lost his newly-purchased-highly-admired-Singapore-sourced-Casio Protrek watch somewhere on the way. As usual, the "lost-and-found" service of Praveen Negi was employed. Commando Shahid insisted upon accompanying him in the adventure. Thankfully both of them returned successful and tired after one long hour. To cut a long story short, this little accident set us back by 90 minutes against the planned timelines. The trek resumed with several necessary halts on the way. The view was so breathtaking, one had to stop to shoot the pictures. Timelines could wait for a while J. At Kabassi Udiar, about 2 kms from the bridge, one could see several large rocks that might be used for shelter (for humans as well as bears). Here Jaisingh did some digging around for medicinal herbs (He called it Chaura- used for cold and flu apparently). After this lovely meadow, one crosses three dried up nullahs and a dense jungle to reach the next camping site. These streams were bone dry, even in the month of November. After about 6 Kms from Bhyunder camp, one reaches a large undulating meadow through which a highly meandering trail passes (one wondered if the route surveyor was following the proverbial path of the calf) to lead on to a beautiful campsite. 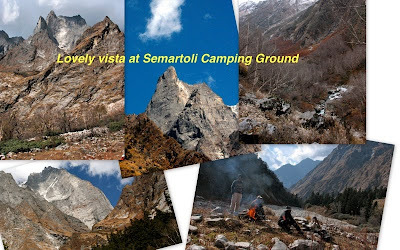 On a good day, if the team plans well enough, it is possible to reach this campsite, Semartoli, in one-day form Govindghat. The camping ground is a dream of a campsite for any size of the group. 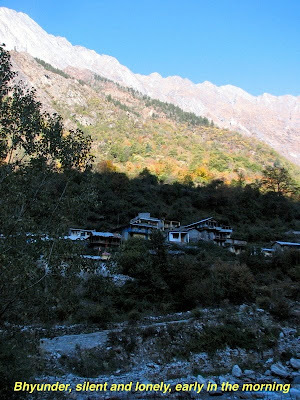 A lone ashram of a Baba looks over the twisting course of the river from the gentle slopes that lead further east towards the head of the valley. The Ashram was deserted however. Waiting for the rest of the party to arrive, I lit up a small fire. The sun was faint with wisps of clouds filling up the sky and it was becoming cold waiting in a half-hearted Sun. Even as we had our lunch I could overhear the porter team grumbling yet again about the distance and the load. We had barely crossed 6 Kms and they were at it again!! I had to do some essential hard-talk. "Aap log agar aise hi karte rahenge, ya to hum tour cancel karenge ya phir apna load khud carry karenge. Yeh kya mazak hai? "- The anger was presumably a manifestation of the helplessness inside. " Aage char kilometer aur chalna hai camp ke liye." I warned. "Koi baat nahin Sir. Chal lenge. "- The Porter Sirdar Dalbir said. They all nodded and carried on. The valley after Semartoli widens up quite a bit and in about 2 Kilometers enters a rocky flat. The PWD trail disappears into the boulder-filled riverbed once too often, the route barely marked by parallel lines of outlining rocks. From a distance we could see the denuded ridges of the Dang Kharak glacier. The Google Earth print-out and the GPS position locator were once again deadly accurate in navigation. We were soon standing beneath the giant wall of the Dang Kharak glacier even as the pregnant clouds overhead hinted of a snowstorm. The wind powered up and little flakes of snow came floating down. He had his mouth wide open, skywards, trying to catch the falling snowflakes. Subhan was following closely behind. Looking at the weather and the gloomy outline of the Cwm area ahead I decided to camp. "Yehin camp karte hain Subhan". The GPS readings said we were short by 2 Kms from our designated target. But looking at the condition of the team, especially the porters and the weather condition, a call had to be taken. "Lekin sir, yahan koi campsite to dikh nahin raha hai" Subhan said, scanning the boulder-strewn riverbed. "Koi baat nahin bana lenge! "- I said. I was hopeful; we should indeed find some leveled patches where we could pitch the tents. The waters of the river gurgled nearby and a birch forest was not too far away. Water and fire and some level ground! That's what we needed for a camp in any case. Soon after the tents were pitched, all of us spent considerable time gathering firewood. By the time the sunset, we had gathered at least a quintal of fuel for our campfire. 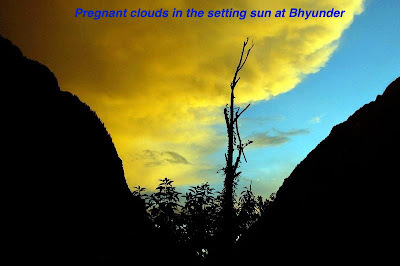 As the clouds dispersed and darkness fell, the glorious view of the Haathi Parvat revealed slowly. The giant mountain and its less lofty subordinates were completely awash with the gentle brightness of a full moon. The -6 degree cold did not deter us from trying out night-shoots in our respective cameras from different angles. Far away in the West, the pinnacle of Mt. 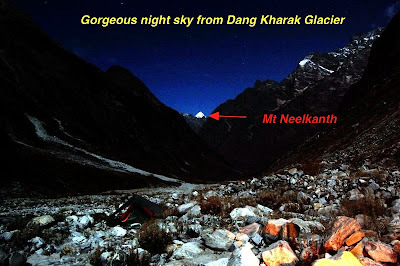 Neelkanth peeked from over the ridgelines of the Khuliaghata ridge. Talking late into the night, gathered around the campfire, the imposing walls of the glacier almost behind us, the whiteness of the snow kingdom visible ahead and all that moonlight magic!! It was another world. 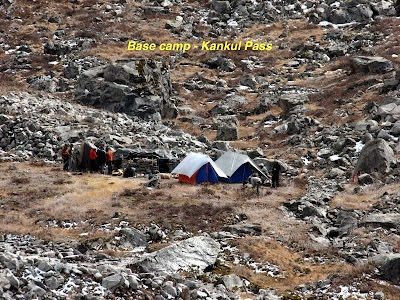 In the maps, Chainyal Kharak (also called Raj Kharak by some local tour operators) is indicated as the final camping ground before reaching the Kankul Pass. 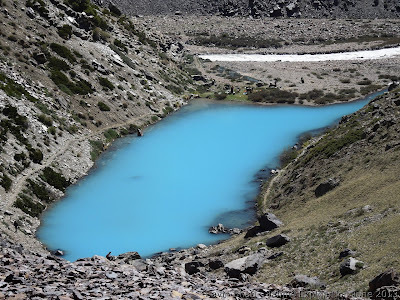 We aimed to camp there or any other suitable camping site closest to the base of the pass and then spend the day exploring till the end of the medial moraine of the glacier. By all estimates, the campsite would not be more than 4 Kms, I reckoned. We lifted camp a little late at about 0930. The day was sunny as usual. Thanked The Mountain for one more day of blessing. The peaks shone gloriously to the North almost over our heads. The Dang Kharak Glacier was a stone's throw away. Negi, Bharat and Kundu had decided to team up together and keep equal speed. Rajesh and I led ahead quickly along with Vinod and Jaisingh. We had to reconnoiter a suitable campsite that can help us launch our exploration into the Cwm and serve as a base camp for the pass at the same time. The steep climb over the moraine ridge on the true left of Dang Kharak glacier, leaves one with bit of a shock. By the time we regained our breath on top of the rise, it was already 1100 Hrs. For some reason, we were having quite a leisurely walk. I wasn't quite sure if it was the altitude or the anticipation of an early camp or just plain laziness. The route, expectedly broken around the glacier snout requires a bit of exploration. In the monsoons it can be a bit of a task crossing the river there. The team spent quite some time shooting pictures near the snout. I was beginning to have bit of a problem with the eyes. A combination of snow and altitude does it to me always. However, this time around there was help at hand in form of the little vial of "Lubrex" that Rajesh was carrying. We stopped several times to administer numerous drops of the magic lotion in my eyes. This shall be a necessary item in my medicine chest from now on. "Lagta hai koi party aa rahi hai udhar se"- Vinod said squinting against the sun looking at the few people coming towards us from the opposite direction. "Kahan se aa rahe hain?" I asked the couple of men who came near. They were loaded heavily and also armed with shovels and axe. For a moment, several unsavory thoughts popped in the mind about possible snow conditions ahead. "Aage se aa rahe hain. Raasta bana rahe the. Snow zyada hai. Wapas jaa rahe hain." One of them said. 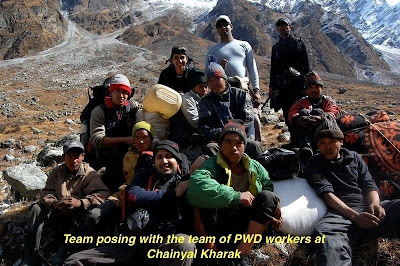 We soon gathered that they were PWD workers, who were calling off work for the season due to heavy snow conditions. 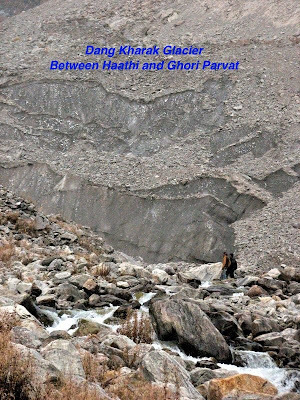 The PWD has done some excellent work in building this trail right till the base of the Kankul Pass. One might wonder why, given the virgin-ness of the valley. "May be the Government wants to popularize the trail for tourists", I thought. This group of workers had another gift for us in form of a well-stocked and well managed camp at Chainyal Kharak as we were to discover pretty soon. The campsite is at the right edge of the medial moraine across a small stream. The team regrouped slowly, a little after midday. Kundu suffered a minor and unnecessary fall into the waters while crossing the stream, rendering the trousers and the shoes completely wet. From the campsite, a little depression is visible due south over a bounding ridgeline. 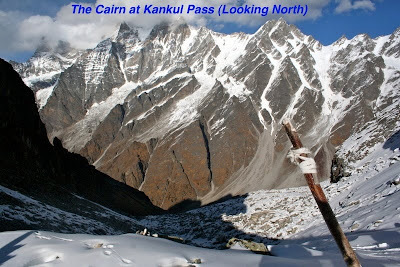 That was the first view of the Kankul Pass. Even in the bright sunshine, the tall and jagged outline was awe-inspiring. After a quick lunch it was time to go exploring the head of the valley in the hope of locating that little lake, yet unmapped but visible from the manmade eyes in the skies. Kundu decided to stay back, still trying to dry up his shoes and clothes. 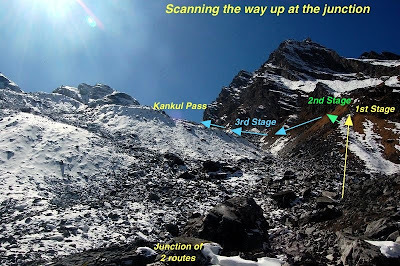 With Dalbir in the lead and Subhan and Jaisingh as assistants, the team started up towards the valley-head flanking the true right of the medial moraine of the Kankul Glacier. 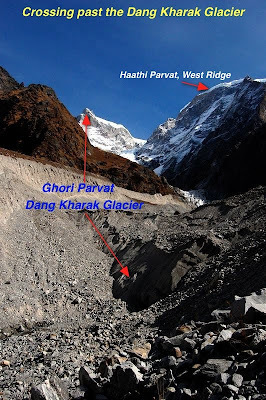 This glacier emanates from the feet of "Oti Ka Danda", the dominant peak guarding the Eastern extreme of the Haathi Parvat valley. The lake was expected to be seen somewhere at the base of that peak, slightly to the west. Countless boulders numerously punctuated the laborious climb up (a feature that would be our companion for next couple of days, we were yet unaware). Finally the group reached a moraine mound blocking the way ahead. Rajesh and Bharat had decided against the late-afternoon-boulder-hopping. "Reached back camp buddy! Best of luck! Not feeling too well. Bharat is also with me, he had bit of a stomach problem"- Rajesh radioed in. "Dalbir ko bhejo aage Subhan. Is chadhai ke baad lake mil sakta hai" I told Subhan. The GPS mapping showed, we were very close to the edge of the lake. Dalbir and Jaisingh went ahead following two different routes. The climb up was in knee-deep snow, probably for about a hundred vertical meters. By 1520 Hrs Dalbir shouted back- "Lake mil gaya sir!!" 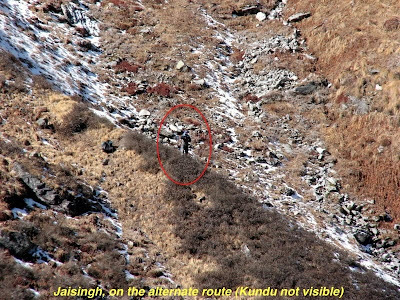 Jaisingh also radioed back the sighting of the lake 10 minutes later. Arun, Venkat and Shahid had gathered by then at the base of the mound, all of them raring to go for the top. I stayed back behind overseeing the respective routes up and coordinating messages through the radio. "It's okay guys. Go ahead, but do start back the moment it is 1600 Hrs, whether you have seen the lake or not" I was worried about the clouds gathering up above. "Aye aye Sir!!" said Arun. They took a sip each from my hydration pack and up they went. After a bit of a struggle in the snow, the team reached the narrow bank of that little un-spoilt beauty. "Ashu Sir!! Lake sighted and conquered!!" As agreed, they all started back in time and the team was back at the camp by 1800. 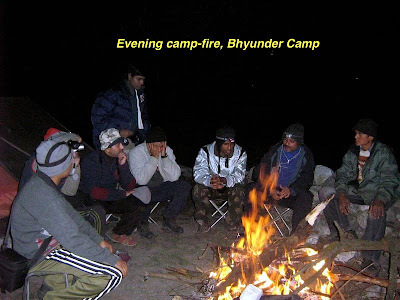 Rajesh and Bharat had set up an ingenious hearth as campfire, inspired by some description in the book that Rajesh was reading. It was indeed, a fine contraption in that windy and flat place. "Dada maza aya na campfire me?" Bharat would have asked me the same question at least three times that evening. Obviously he was happy with his Joint Venture handiwork with Rajesh. 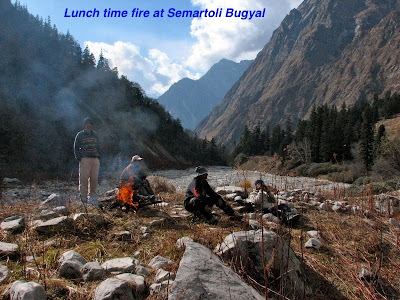 Happy conferencing followed, sipping on tasty Daal borrowed from the Porters' kitchen around The Campfire. Everyone was discussing the interesting little excursion and exploration of the unmapped lake. We decided unanimously to call it the Haathi Taal- named after the presiding peak of the valley. 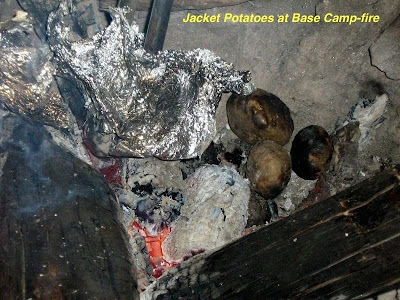 The salient aspect of the evening was, however, the delicious Jacket Potatoes that Bharat produced from the campfire. The barbecue, suitably interspersed with jewels of wisdom about women and love, lasted late into the night. "Yeh ladkiyan jo hoti hain na dada…" and another long discourse from Bharat Tomar would follow. That was the first of the many times that Bharat's culinary expertise was to be tested, with resounding success, if I may add. Thankfully the skies opened bright and clear, the next morning. 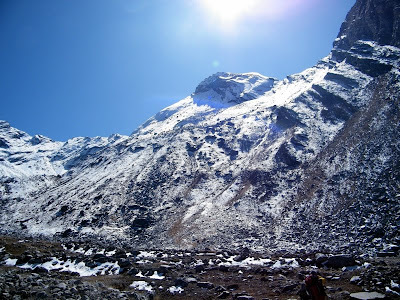 That is a piece of luck every trekker prays for in the high mountains, especially in the winter. Any precipitation in this season means heavy snows in the high passes, which makes even a hundred feet look like a mile of ordeal. All in high spirits, the morale high with the exploration of the previous evening, the team set out for the Pass. 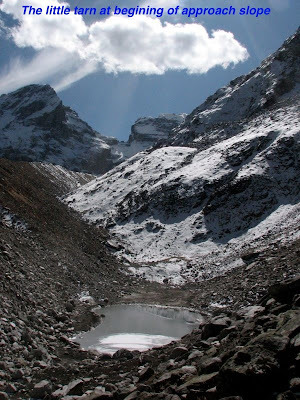 We were to cross the pass and camp near the Kagbhushandi Taal by the end of the day. The distance wasn't much, but the difficult terrain would take up much of the time. "Difficult Terrain" was an understatement, as we would realize not long after. 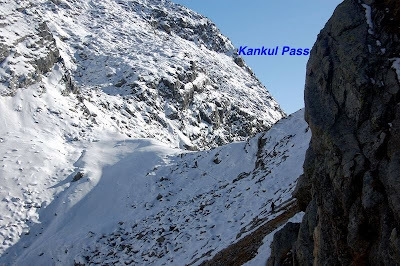 The trail to Kankul Pass from the Chainyal Kharak campsite winds up in a confusingly serpentine fashion towards the general direction of the pass. Since Kundu was suffering a bit from exhaustion, it was decided to send him ahead with Jaisingh an hour before rests of us were to start. Just when the duo vanished ahead of the last visible bend on the trail, Rajesh and I started off. About a kilometer later the faithful and well made Chhe Phuti, which had been our companion since Govindghat, just trailed off; probably a result of the abandonment of work by the group of PWD workers whom we had met the previous day. Jaisingh and Kundu were nowhere to be seen. We decided to follow the general direction where the trail was headed last and found ourselves standing on the left edge of the medial moraine. Beyond a ravine below, the tall ramparts of the ridge rose several hundred meters above us, due south. A gentler slope leading to the top could be seen further east; in fact Subhan had indicated that to be the route the previous evening. We failed to notice Jaisingh and Kundu trying to follow a shepherd trail directly due South where the forbidding wall of the ridge rising above us. We decided to move east towards the slope. The entire team was on the move now, following different trails, generally guiding each other over voice and radio calls. Just then someone pointed out Jaisingh and Kundu trying to negotiate an alternate trail that looked fairly challenging from where we stood. Upon our repeated calls to come back and join the route we were following, Jaisingh radioed back his confidence about the route he was following with characteristic nonchalance. "Poora rasta bana hua hai sir idhar se. Bakri wala rasta hai. Boulder aur snow bhi kam milega." – His voice came over the radio. "Ooper difficult lag raha hai Jaisingh." I radioed back anxiously. "Maine dekha hai Sir. Kuch problem nahin hai." – He replied. I could imagine the impact this conversation might be having on Kundu's morale and decided to trust the instincts of the veteran. There was a quick consultation among Vinod, Subhan and I. We decided to proceed fast and be at the top, where the two routes appeared to converge, as soon as possible. In case any help was required in terms of fixed rope, Vinod could then go down and help Jaisingh. We should have known the old man better, as we would realize later. The real ordeal started after that. Soon we were to realize, how true and correct Jaisingh's gut-feel was! "These sherpas have a way with smelling their way through. This bugger Jaisingh practically sniffs his way out!" we would discuss later that evening. Where the rock and shrubs of the medial moraine ends and the snow & grass covered bouldered slope starts to the top, there is a small glacial tarn. I noted it for future reference. It could be used as a bivouac site or for setting a small base camp for the Pass. The immediate increase in the steepness knocked the wind out of us. Soon we were boulder hopping, each hop becoming longer as we proceeded ahead. At one point, Rajesh stopped. Huffing and puffing heavily he put his trekking pole between two boulders, which clearly indicated the gap to be close to 6 feet. In that section of the climb we were basically following the porters, who appeared to be flying across the boulders. 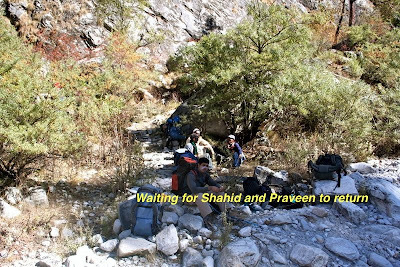 Vinod and Subhan were much further ahead aiming to reach the junction point from where they could oversee progress on both the routes, one that we were following and the one that Jaisingh was following with Kundu. By the time we reached the junction point, all of us were totally exhausted, frustrated with the snow, run out of drinking water and hungry. We had not had a morsel of food since morning and it was already midday. The saving grace was the clear sky and the blazing sun overhead. We tried having some chocolate bars and some ice-melt for drinking. I still remember stuffing my hydration pack with powder snow, desperate to have some water for the climb ahead. Soon Jaisingh and Kundu appeared. Kundu was exhausted too from the steep climb. They however, did not have to go through the painful and risky boulder hopping that we had to do. The mountain had a different challenge for everyone. Little had we realized that we were only half way through the climb! We still had to cover 400 more vertical meters. The climb was divided into three distinct stages, each stage visible directly ahead from where we stood. The first two stages were through brown and dried grass over a steep slope. The final stage was along a wall, the track made of rock and snow. We had to hurry, if we were to cross the top before the iffy mountain weather played truant in the afternoon. Rajesh and I took the lead again. The steep climb ahead was on slippery dried grass. Far below on our left lay an angry bed of boulders awash with brilliant-white snow. Hungry bodies and thirsty throats struggled for balance. On such slopes essentially one walks on the sides of one's feet. Prolonged exercise of this nature become agonizing for anyone. The porters seemed to be forever ahead of us. They were now showing their true mettle after all the grumbling in the previous days. Resting under a rock after the first step I chanced to take a look around. 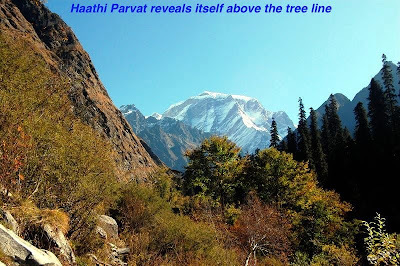 The proud Hathi Parvat stood tall directly North of us. The Kankul Glacier lay below its feet with a East-West orientation, looking like a wide highway constructed with great care. The surrounding peaks at the head of the valley, due East stood encircling the head of the glacier as if blessing it with silent magnanimity. Small crevasses on the glacier and its medial moraine were visible from where I stood. I could make out the small depression where the Haathi Taal (one that we had explored the previous evening) might be located. The Taal, however, was not visible. It wasn't visible the entire way till the top; one of the possible reasons why it might have been uncharted in the British Army Map (1937). Soon the rest of the team caught up and we had to plod on. After a long, tedious, highly punctuated and exhausting hour we finally caught the summit slope. "Wo raha pass"- Subhan said. "Dalbir pahunch gaya hai do porters ke saath." Seeing the small cairn from that distance, our morale perked up. With Subhan cutting the route through knee-deep snow I finally reached the top at 1430 hrs. The altitude reading had beaten my calculations. We were well over 4700 mtrs at the top of the pass, 4713 meters to be precise. Beyond lay the Kagbhushand Gaad valley leading on to Alaknanda. The comparatively low-lying Shivalik mountains appeared ghostly on the horizon with their faint purple-blue outlines. Looking back one could see the Haathi Parvat valley and the slope leading to where I stood. I could see our team snaking its way up. A large, lazy and struggling snake :-). Rajesh reached up soon. As he reached the top his hands folded in salutation to the great Mountain, as if he was seeking blessings and was thanking the King of Mountains for have ended the trying part of the day. In the next one hour all of the team members arrived one by one- first Shahid and then Arun, Venkat and Bharat Tomar. Kundu was much far behind struggling his way through the deep snow. "Kundu! We have reached the Pass." – Shahid was shouting at the top of his voice into the radio, exhorting his tent-mate to come on. "Aa raha hoon main" came the disinterested reply. He obviously had more pressing matters at hand to deal with, all that rock and snow and slippery ground J. After waiting a while, we decided to leave Subhan behind to wait for Kundu and started for the camp. 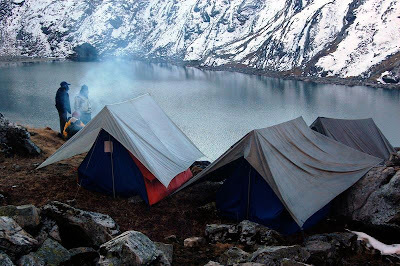 Some porters had gone ahead to look for campsite near the Kagbhushandi Taal. We were eager to join them. All we needed was water to drink and the warmth of a sleeping bag. The boulder hopping started again, albeit for a much shorter duration. With the mind divided between the boulders and the safe arrival of Kundu, we finally reached the end of the platform from where one could see the emerald jewel- Kagbhushandi Taal. Soon the tents were visible, pitched right near the West bank of the lake. The team morale shot up again and we all were at the camp by about 1600 hrs. Just when we were about to rest in the dying rays of the setting sun, Subhan appeared informing us that Kundu had crossed the Pass 15 minutes back. I think, the sun set the fastest that evening. By the time we had finished clicking couple of snaps of the beautiful lake, darkness was descending with cold ferocity. Before long, the temperature began dipping below the zero mark. With the headlight glowing on his head, Kundu finally appeared. I was waiting for him outside the Kitchen tent. He rested on the rock alongside and almost collapsed. The gentle giant had been drained off his last ounce of strength. No campfire that night. Food was served inside the tent as members refused to brave the cold outside. Shahid was heard discussing the day with Kundu late into the night. By now, it was habitual to hear Shahid giving a motivational spiel to his tent mate for several hours. I was happy they had bonded well. All that bonding was going to be necessary for the challenge ahead, challenges I was not yet aware of. It was a visual treat next morning. 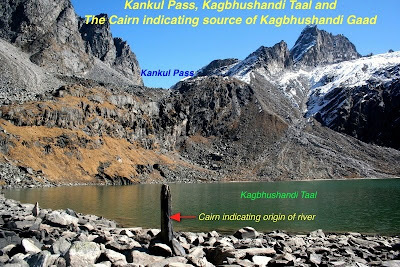 The large water body of Kagbhushandi Taal appears emerald green during most part of the day, possibly due to the immense depth. When you combine that large emerald with its lightly shimmering tranquil waters, with the snow covered mountainsides, the thin morning mist that hangs above it and the early rays of the rising sun that light up the lofty peaks around, you are transported to a different dimension. Even for the non-believer there would be a moment of silent gratitude for all that sublime beauty. A small river emerges from the Southwestern corner of the lake, the point well marked with a cairn. 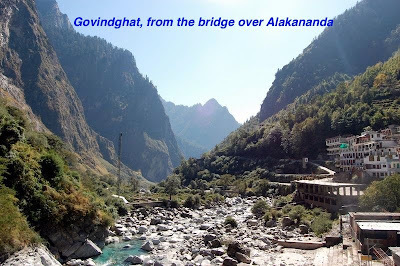 The route to Joshimath touches this point, rises over a mound to its south and descends further ahead. We watched Subhan and Kundu disappear down that route around 0730 hrs that morning. To reduce variability in arrival at the evening camp we had again requested Kundu to start early, for which he sportingly obliged. In fact he had slept with his shoes on, the previous night to reduce start-up time in the morning. Dedicated lad he was!! With the bright sun beating overhead, we proceeded down to the very edge of the waters of Kagbhushandi Taal and then over across the steep contours of the mound to the south. The view beyond opened up into a huge bowl of a valley. Further south a wall of high ridges blocked the way. Seeing this on Google Earth I had earlier charted a possible route along the riverside down the South West. Subhan, Kundu and few porters were well ahead of us. Vinod and Jaisingh, new in the area were leading us across the mountain face locating distant cairn marks. Till then I was thinking that the route was across a n easy looking pass to the South East. However, all doubts were put to rest when Subhan said it over the radio. "Sir, woh samne raha pass." "Kaun sa Subhan ? Woh bayen wala? Jo boulders dikh rahe hain?" I asked to clarify. "Woh nahin Sir, yeh pass cross karna hai. Dahine wala..jo wall dikh raha hai". What happened after that is narrated as the opening scene of this article. We were stunned for a moment looking at the obstacle. 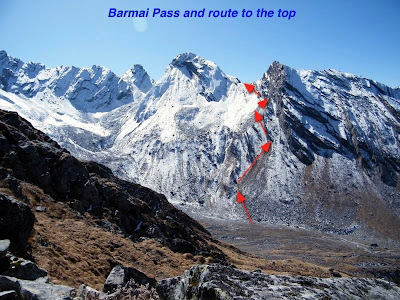 It was forbidding in the strictest sense- The Barmai Pass. This must be one reason why not too many successful accounts one reads of about the crossover to the lake from Joshimath and back. 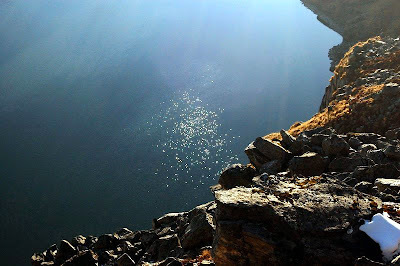 There is this most imposing wall of a pass that stands in between the leading ridge to Joshimath and the emerald lake. Few hours later, marveling at the 360-degree view around we looked down into the other side of the watershed. While the climb up to the pass was a struggle in powdery, unstable snow, the other side looked frustratingly boulder-strewn. No one amongst us liked the remembrance of the toil of the previous day. However, a camp had to be reached, before sundown. "Mera jute ne dhokha de diya dada" said Bharat, he wasn't looking too happy with the experience of treading through powdery snow on that 60 degree slope. 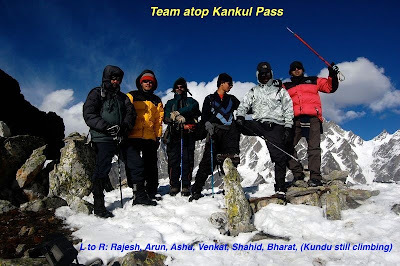 This time around we waited for Kundu to reach the top at 1600 hrs and later proceeded down together. 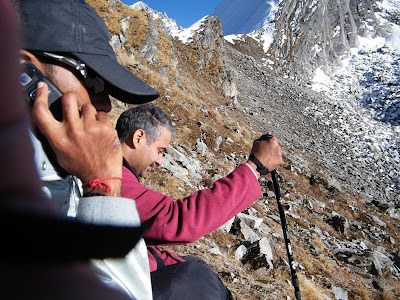 I also recall, quite fondly if I might add, the animated conversation Arun and Bharat had with some lady friend ( the GSM phones were suddenly detecting telecom traffic once we were atop the Barmai pass) and how Bharat forgot the name of his tent-mate Arun while handing over the phone. 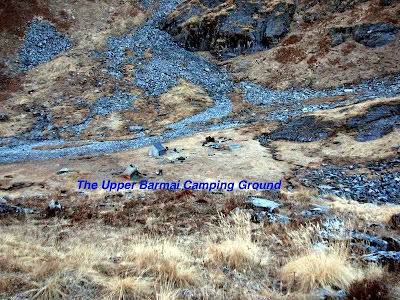 The camp that night was on an ideal camping ground, the Upper Barmai camping ground. The campsite is in a deep recess with an absolutely flat ground. To the west, a deep valley leads forth. One of the senior porters showed us the deep gully coming down from the ridge to the south. 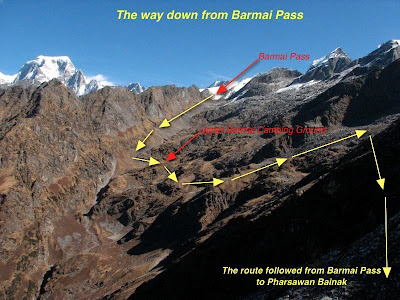 That was the alternate route to Barmai Pass. It is a decent route for one or two people. But for a team of 20, it is like inviting disaster. We were happy with our decision. The campfire was with freshly cut Juniper bushes. With the fragrance of the Juniper hanging on our jackets we retired into our sleeping bags early that night. Enough of struggle and surprises for one day!! It was evident from the location, the previous evening, that the Sun would break late at the campsite. It is in fact located in a deep recess, much far down the contours of the mountainous ground around. Having finished our morning chores early, in the chilling shade of the surrounding mountains, we were off for the day's hike by 800 Hrs. As an interesting aside, Arun Negi reported of a stubborn bird that teased him all the way through his process of ablution. While Arun was in a sensitive and vulnerable posture (squatting on the rocks J) the bird would start calling out and stop the moment Arun turned around with much effort at balancing. We named it "Shaitani Chidiya" -The impish bird. As usual, Subhan and Kundu had left early. After his tough experience with Jaisingh on the day of Kankul crossing, Kundu now preferred Subhan as his lead. Today we had to reach a hilltop, Pharsawan Bank, due South West. One expected to get a well-constructed Chhe Phuti after that, leading all the way down to Joshimath. 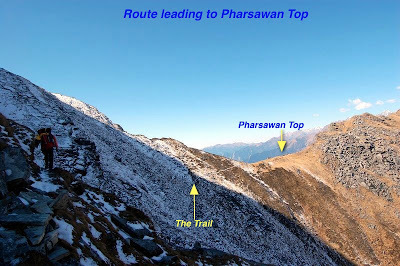 After bit of confusion in the route ahead, we finally hit a proper trail and were on the Hill top of Pharsawan Bainak ( I am yet not sure about the name, whether it is Pharsawan Bank or Binayak or Bainak- Bank would mean a glacier, there is none. Binayak would indicate a Ganesha temple, there are some deities in the little stone temples at the top, but none of Ganesha)by 1000 Hrs. Altitude reading: 4215 Mtrs. Kundu, Rajesh and I were there almost at the same time. 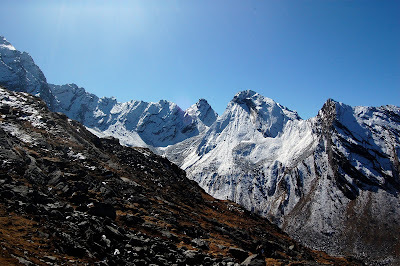 After a brief talk, Kundu left and we waited on enjoying the sprawling view of the Alakananda Valley with Auli and Gairson Bugyal directly ahead. One could see the white dots of the buildings detailing the Joshimath town. I wondered for a moment about the extent of descent. It is only then that I realized the challenge ahead for the day. Assuming, the Alalknanda road-head at a minimum altitude of 1800 mtrs, we still had about 2400 mtrs of descent to do!! 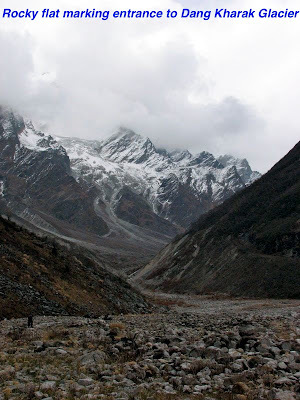 (It later turned out that, Vishnuprayag was, in fact, at 1600 mtrs and the total descent from Pharsawan- 2600 mtrs). The entire troupe regrouped there by 1100 Hours. During the short stopover there, Dalbir sustained some bloody injury on his forehead. In the usual lively banter amongst the porters he had rolled down over and hit his head on a jagged stone. The crisis was quickly attended to with state of the art first aid from our medicine chest. A brief photo session thereafter it was time to start the Grand Descent. And Boy! Was it a descent? It was the Mother of all descents I have seen in my life.!! The route undulated up and down (but generally down) till we crossed two small passes (in fact, transverse high spurs along a North- South ridge that led all the way down south). After the second high point, there was a sharp descent of about 400 mtrs ending at a trough on the ridgeline. After reaching there we saw another gigantic descent down on the other side of the ridge. The muscles in the thigh and the calf were already protesting when we looked down at the tiny Painkha village form that high vantage point. This place was called Jabar Kharak. 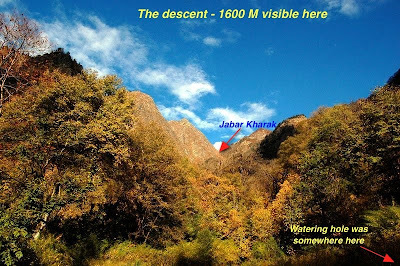 The first camping site if we were to attempt this route from the Joshimath side. "Paani hai?" some one enquired. We looked at each other and were to our own thoughts for a while. We were running short of drinking water yet again. "Jaisingh aur Praveen aage jayenge aur Paani ke pass rukenge"- Vinod said. The dreadful descent ahead of us, we trode on the path ahead, with parched throats- our minds singularly focused on getting some water. We lost the count of the number of hairpin bends we negotiated. What I remember is the several near-falls I had, my shoes slipping on the thick foliage, which sometimes blocked and sometimes carpeted our track. Shahid was just ahead of me, desperately searching for water and a leveled patch of ground where he could offer his Afternoon –Friday prayers. But he would have no such luck. Finally, the good news came around 1400 when Praveen informed the team that they have found water. "Kahan mila, Gaon pahunch gaye?" I asked. "Nahin sir, Gaon to nahin hai. Yahan jungle ke andar Paani ka dhar mil gaya. " he informed. That's the only place we have rested during the descent. After some quick refueling of water Shahid, Rajesh and I started off again. There was a bit of confusion in the route ahead. 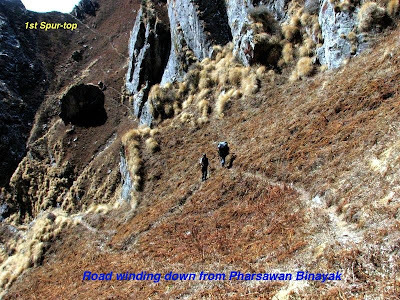 But soon we hit a Chhe Phuti trail and we were at Painkha village by 1530 Hrs. The village wasn't as deserted as it was in the Laxman Ganga valley. 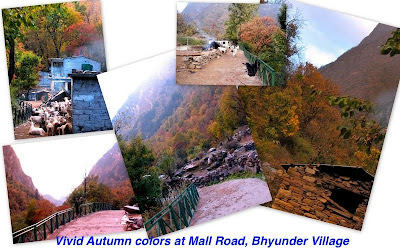 The village was well inhabited and was looking in good economic health; probably because of the proximity to the Joshimath town. From now on, the trail became a concrete track- much more defined and sure; but a tad difficult to walk on. The speed became faster as the black line defining the national highway loomed into view. I was at the road-head by 1630. Rajesh, Shahid and Bharat arrived within the next hour. Phew!! The final calculation showed a total descent of 2630 Mtrs. My biggest descent so far! Never ever in my life have I descended 2630 meters in one go in a single day. 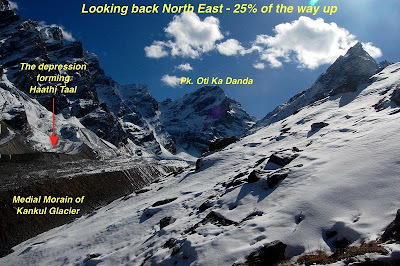 There was news from the top, that Kundu is unwell and might have to be rested at Painkha village at night. None of us liked the idea. A horse owner was found hastily at Vishnuprayag and his horse was pressed into service to retrieve Kundu till road-head. Bisht, the faithful mountain driver was waiting with his Mahindra Commander. Two ferries of his vehicle were required to evacuate the entire team, luggage and equipment to Hotel Trishul at Joshimath. Waiting for the quorum to build for the first ferry, we witnessed the most majestic view of a family of Himalayan Thar on the right bank of Alaknanda. A whole family of Thar was grazing, the calves cavorting and the bull and the cow desperately herding them in. The Thar is an interesting cross between a wild boar and a goat and an Ibex. It is powerful yet agile. The spectacle lasted for a good half an hour. By the time, the second ferry of the Mahindra Commander arrived at the hotel it was 1900 already. A celebratory party was hastily organized for we had to leave early next morning. Rajesh ruled the roost that evening, recalling and narrating and re-living interesting moments of the week gone by. As usual, the Mountain gifted. Yet again, not just the elevating experience but also another bunch of dear friends. As it happens always, one is tied together initially by a common purpose. The extreme life on the mountains however, lets one discover several aspects common and aspired in each other and you become friends for life, without even realizing. It was like going back to college days, in the company of these sprightly young-men (Rajesh looked younger than them all in bearing and demeanor as well). The drive back to Delhi was relatively more continuous and less time taking. After a 16-hour marathon we were back in the city well before midnight. Apart from the team (diverse, jolly, fit and tightly knit), the trek stood out for a few more points worth remembering. The time of attempt of the route, the exploration of the glacier & Haathi Taal and the 2600 mtrs descent were all unique in their own way. 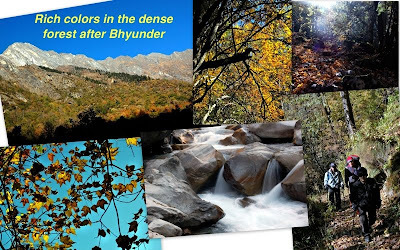 Not a single soul, or an animal was sighted for better part of the way and when it was time to sight one, it was a whole family of the rare Himalayan Thar. 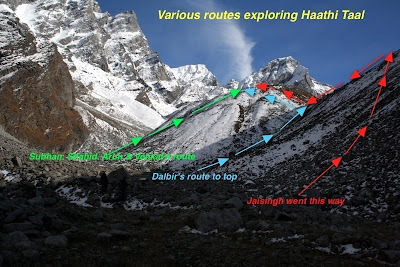 The virginity of the route was abundantly evident the moment we headed East into the Haathi Parvat valley. What remained, as a nagging thought, was the omniscient scarcity of water. The streams were thin and the nullahs dry. The relatively fresh moraines near glaciers indicated some fast recession. The lovely stream bed of Barmai Camping ground looked like a cobbled street. Probably, there just wasn't enough glacier ice to provide the melt water. The Kagbhushandi Gaad was without water. During the long descent in the last day, during that desperate hunt for water, we did cross several streams. But all of them bone dry. The entire mountainside drained into but a small stream, carrying about four faucet-full of water! Observe keenly, and it points at the dying throes of an already-fragile ecosystem. What tragedy! Here is the highest landmass of the world, many nooks and crannies yet undiscovered and unexplored. Here is the third highest freshwater reserve in the planet (apart from the two poles) that has fed some of the fiercest and mightiest of the rivers. Yet it dies before our very eyes. Withering away slowly, even before being seen completely. Beautifully written. The introduction was a master piece. I see you through this blog a script writer, a photographer, a director and an editor. Looks like you have plan to make a documentary using this blog in future!!! Very true and thoughtful narration of the trip. Keep it up dada....I really enjoyed every bit of it straight from my heart and mind. Like others mentioned, the introduction was fantabulous...cheerz. Hey thanks PK...thanks for the words of such beautiful compliments ..
WOW..What a wonderful post! RELIVED every moment of the trek! Thanks Dada once again for organizing such a beautiful trek....for documenting Expedition Airaavat :) and I am in total agreement with everyone...Intro was mind blowing!!! But, what has just been in my experience...an image of those fine moments...a flight upon wings of your travelogue, has reassured me of great contributions of life beyond its own shell and of its magic to turn real into fantasy and fantasy into real. It took its flight with climax as would a mountain eagle set a few hurried flutters of its wings to glide straight to its prey...and I'm am killed by its suave blow ! Thanks, Ashu, for killing me so instantaneously through this brilliant piece of literary work ! I loved it more to see some of my known faces in the team...Arun is Lopa's contact on Flickr...Anand has a great contributor to our blog journal, "Wandering souls...." and perhaps, I did a trek with Dalbir in the past; and yes, you..
Congratulations to each one of the team for creating another harmony to be listened to by many...and inspiring Ashu to share such melody so passionately with us who still care to believe that the finest music is the way all birds sing together at the first drop of holy ray in the east !! Hi, Great reports here. However, how could you carry a radio to the mountains ? Especially where a permit is required to trudge. Is it allowed ? Apparently this is what the Chinese comment mean :-) ..Lovely words! "The value of life and his happiness lies in his ability to value their own survival"
Yes, whenever permits are applied for, the mention is made as a necessary survival equipment. Moreover tey are wlakie talkies rather than VHF radios, - exactly not espionage devices :-)...more survival gear! and when the Government issues ILP and trek permit, they often times insist on carrying sattellite gears as in Kalindi khal trek...in many such treks dangers to life and rescue are greater needs. 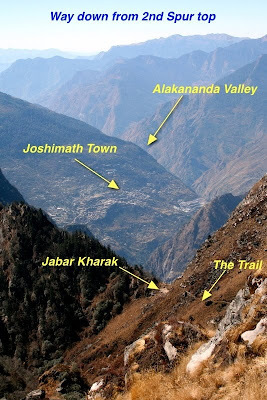 Joshimath, Govindghat, Bhyundhar Valley, Hemkund, Valley of Flowers...are familiar to me, having trekked there. And while in those places, I have been in awe at those mountains afar and my wonder and admiration for them continues. Delighted to have come across this fabulous recount of your exploration and expedition of those very mountains. Enjoyed reading every bit of your adventure, and thanks for sharing. Nice write up Ashu Sir. Liked it a lot & have decided to do this trek this October. Will it be possible for you to share any contact details of guides for this route? I lived every minute details and found them very much interesting and informative. I visited the place in 1994 and cherish it in my memories. 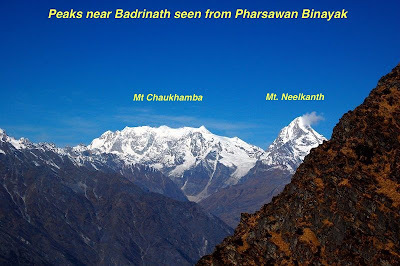 In my facebook album for this trek, I have given link to yours this blog as I could not give this much nice details. Thanks a lot and wish you move a lot of wonderful places and keep on writing quality stuff like this. Cheers for the day ! !